Fire up that grill and make some pizzas! It’s really not that hard. Slice up a couple of tomatoes (about 1- 1 1/2 per pie) into 1/4″ slices. Put them in a bowl with some salt, herbs, oil, and vinegar. And just let them sit for an hour or so until you’re ready to grill. When the grill’s ready, throw the tomato slices on and grill each side for a couple of minutes, so that get some char and get soft. Throw them back in the bowl and mash the slices, so end up a chunky sauce. I’ve used lots of different recipes in the past for pizza dough. I’m quite partial to the one in The Bread Bible which is very wet dough that results in the great combination of thin and crispy and airy and doughy. The Jim Lahey No-Knead Method works, too. But, I’ll confess, this time around, I just picked up some dough from the Italian Store. Whichever way you go, roll out your dough so it’s pretty thin and about 12″ in diameter (make sure your grill can accomodate) and set it aside to proof for at least an hour. I let my uncooked pies rest on an oiled cookie sheet. Anything that works on a regular pizza will mostly work on a grilled pizza. Remember, you’re going through the trouble of firing up your grill, so maybe you might want to grill some of those toppings too. Grilled peppers, onions, zucchini? All good. You can use any shredded cheese you would normally use. If you’re going to fresh mozzarella route, like I did, I suggest cutting it into slices and squeezing out any excess water, by laying them on a plate covered in paper towel, set a another plate on top of that, and then weigh down the top plate. Get that grill good and hot. First thing is to grill those tomato slices for the sauce. And then any other toppings you’re going to grill. From here, it’ll go pretty quickly. Take one of your rolled doughs (or however many will fit on your grill at once) and lay it on the grill. Just let it sit for at least a minute without moving it. Then take a peek at the bottom to see how it’s doing. Feel free to move it around if the heat of grill is inconsistent. You’re just grilling the one side for now. It should get pretty dark, even black in some spots, but don’t burn it. Depending on your flame, this should only take a couple of minutes. Once that once side is done, pull it off and lay it back on your cookie sheet cooked side up. On the cooked side, spoon out your sauce, apply your cheese and other toppings. Then back on the grill to cook the bottom side. This will take just as long as it took to cook the other side. It goes so quickly that I usually don’t bother putting the lid on. And that’s it. Pull that sucker off, slice it up, and enjoy. 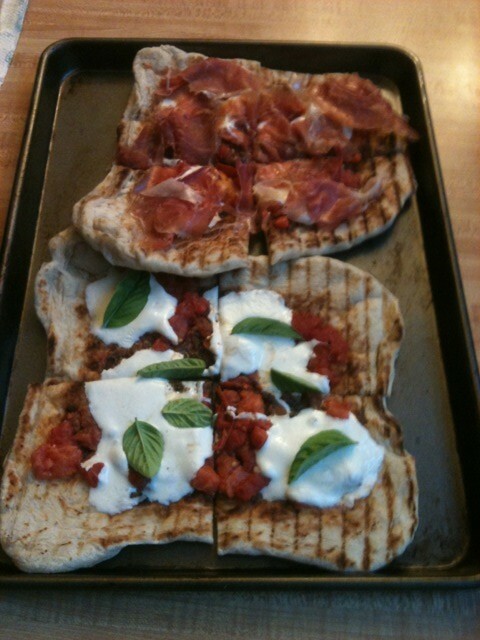 The pizzas I made above were almost identical except one got some fresh basil tossed on after cooking. The other got some excellent Surryano ham from Surry Farms, in Surry, VA. A proscuitto-like ham, except it’s smoked. Really good.